Talking Breads Bakery is located on a 45-acre farm in Shermans Dale, PA. Founder and head baker Shana Slossberg creates a variety of hearty, Old World breads including an airy Italian-style Ciabatta and a crusty French-style Batard. Her rustic Miche (pronounced meesh) loaf is sourdough-leavened using a “mother” (starter culture) Shana has been feeding for ten years. 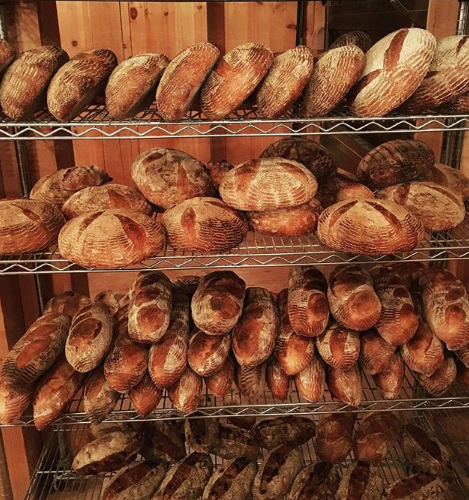 Talking Breads uses a blend of whole wheat, whole grain, and rye flours — all organic and ground on-site in their Austrian Osttiroler stone flour mill. Shana’s husband Joe Amsterdam occasionally helps with baking, but mainly he runs the farm, which focuses on humanely raised pastured animals, including poultry and pork. In recent years they’ve added a small plot of wheat on the farm, and they hope to one day grow 100% of their own flour grain. In the meantime, the flour grains are primarily sourced locally within a 25-mile radius of the bakery. You might have guessed that Talking Breads is named after Shana’s favorite band, but over the years as she’s been asked to explain the name, increasingly she answers that their breads “speak for themselves.” We agree!